We decided to celebrate the vernal equinox by planting a tree. We just so happened to have a pomegranate tree which was a gift from M. Homan and family for Persephone’s second birthday. Of course, the vernal equinox is traditionally regarded as the beginning of spring in the northern hemisphere. It’s a time of year positively fraught with significance. In Greek mythology, spring begins when the goddess Persephone returns to the upper realms and is reunited with her mother Demeter. So this seemed perfect. The equinox fell at a most convenient time, about half past noon Saturday, and that’s when we planted the tree. I had Persephone throw a few rosemary leaves into the hole before we put the tree in, symbolizing our wishes for luck, rejuvenation, cleansing and energy. We are still concerned about the toxic levels of lead (and who knows what else) in the soil around here, so we took pains to make sure the girl didn’t touch any dirt and we cleaned up carefully afterward. I was skeptical about planting a fruit tree in soil that may be contaminated, but my reading on the subject indicates that while toxins accumulate in the roots, they don’t tend to make it up to the fruit. The Homan family was unable to join us for this little celebration, but they loaned us a shovel. When we passed by their house this morning, the entire family was planting trees. I also have it on good authority that a bunch of students from the University planted 200 trees yesterday. 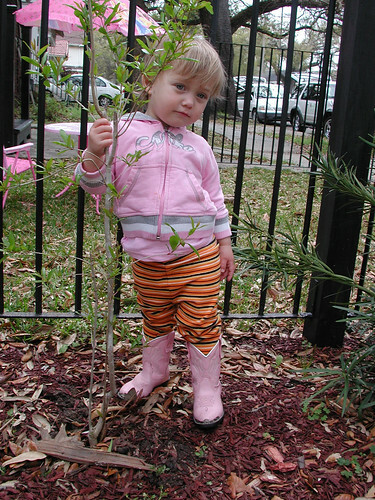 All in all, a good weekend for trees in New Orleans. She just gets cuter by the day B! Love the pink cowboy boots! In Farm City : The Education of an Urban Farmer (2009), Novella Carpenter tells of an Oakland orchard that was planted on contaminated soil. Regular tests showed that the fruit wasn’t toxic. However, the soil toxins soil appeared in the leaves, which had to be taken to a landfill. I had the same concerns about planting fruit/vegetables, but was assured by my MIL (gardener and environmentalist extraordinaire) that the fruit wouldn’t be full of nasty stuff. She cited an LSU Ag study that I haven’t read yet. And that child–I just can’t get enough of the pink boots. I saw a bunch of young folks that could have certainly been students planting trees late this afternoon near Broadway and Panola. Quite a few – I saw what appeared to be 20 or more without even looking that hard.